Rachael Champion (b. 1982, Long Island, New York, USA) graduated with a Postgraduate Diploma in Fine Art from the Royal Academy Schools in 2010. Champion lives and works in London. The artist’s site-specific sculptures and installations are engaged in a discourse surrounding the paradoxically co-dependent relationship between our built environment and the natural world. Her works address the corporeality of the materials we extract, transform, and consume and how these actions affect the physical characteristics of landscapes and ecosystems. Champion questions the layered and dynamic complexities of our ever-changing physical environment coalescing at an intersection between architecture, industry, biology, and geology. 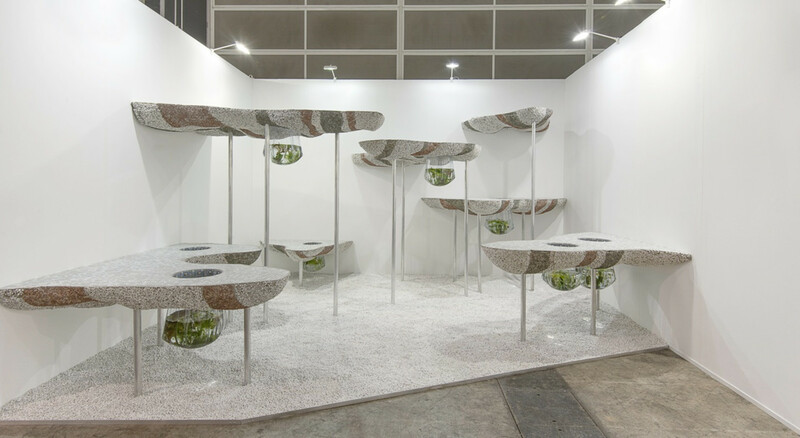 Contrasting industrial materials with ecological matter (such as plants, grasses and algae), Champion explores our interrelated expectations of the two. Carefully orchestrated arrangements of both synthetic and organic materials create environments that resonate a sense of imminent 'otherness'. Champion speaks of future bi-products formed from a merging of the artificial and biological. The artworks generated from this homogenising of material see ecological matter absorbed into an indeterminate, dystopian system. Champion is drawn to materials commonly found on major construction sites and development projects. These industrial products (often hidden in the landscape or considered objects to assimilate into natural environments) are deliberately focused on the basic but essential examples of plant life, and presented out of context so to juxtapose their alien sculptural qualities with an inherent functionality. The living matter sometimes included in the work (which often has to be maintained throughout the installation’s life) not only emphasises the temporal nature of these fabricated environments but also encourages the spontaneous evolution of the piece. Champion has been awarded the Arts Foundation Award for sculpture (2013) and the Red Mansion Art Prize (2010). In 2012 she was the Camden Arts Centre 'Artist in Residence'. In 2016 Champion was selected as one of the artists honoured at the gala for the Hirschhorn Museum and Sculpture Garden. Champion's work has been exhibited at a number of recognised international spaces including Modern Art Oxford (UK), Zabludowicz Collection, London (UK), Socrates Sculpture Park, New York (US), Bold Tendencies Sculpture Project, London (UK), Enclave Projects, London (UK). In 2013 Champion's ambitious, site-specific work, Forced Landscape, was installed in Derbyshire as part of the Wirksworth Festival. In 2017 Champion completed a permanent installation on Sarvisalo, The Zabludowicz Collection's outpost in Finland.